PHOTO 1. On route to the PaardenKloof cellar. PaardenKloof in the Overberg is one of the best practical examples of biodiversity where white and red cultivar wines, different fynbos species, Nguni cattle, Dormer sheep and personal attention form one great biodiversity family. Since 2001 Mohseen Moosa, a formal legal consultant, and Daphne Neethling, a linguist, are passionately busy to convert the farm of 1 430 hectares according to their vision. The farm is situated at the foot of the Babilonstoring Nature Reserve on the Bot River side of the mountain. The Hemel and Aarde Valley is on the other side of the mountain. The climate of these two regions differ considerably, although they are close to each other. The humidity of PaardenKloof is much lower, but as result of the altitude, the night temperatures are low. Water is abundant as result of the Leeu and Gouka Rivers which flow from the mountains into different dams. 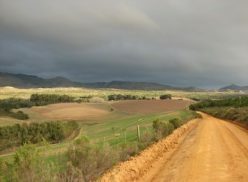 It forms part of the Kogelberg and Overberg biosphere and has a long history of Khoisan tribes, who stayed there and farmed with Nguni cattle. The Voortrekkers also used it as a farm for their horses. The Khoisan tradition is continued with a herd of 220 cattle, which supply high quality meat and hides to the South African market. More than 400 Dormer sheep are annually supplemented by lambs and organic meat is produced. The meat is amongst others sold to the Ecology Restaurant, which is also owned by them. 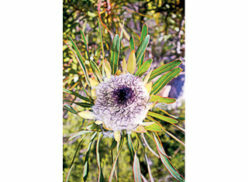 The nature treasure of PaardenKloof is, however, focused in the more than 1 000 hectares which is conserved as fynbos. A botanical survey identified more than 180 indigenous species, which consist amongst others of 24 Proteaceae and 28 Erica species. It also included four endangered and seven vulnerable species. Although the soil type is mainly of sandstone origin, the differences in altitude, slopes and aspect create the occurrence of different specific sites, with unique terroir characteristics on the farm. Twenty-three hectares vineyards of Cabernet Sauvignon, Shiraz, Pinot noir and Sauvignon blanc were consequently established on the farm in 2004 on sites which are the most suitable for these cultivars. The different vineyards are registered as single vineyards. 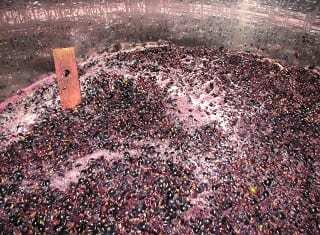 The first wine was made in 2007. An interesting business model is applied for the winemaking. Although the vineyard management is done by Mohseen himself, the wine is made by a contract winemaker in neighbouring cellars, but matured and bottled in PaardenKloof’s cellar. The wine is consequently certified as Bot River Wine of Origin in the Walker Bay district. Crop control is applied in such a way that a yield of 6 to 7 tons per hectare is maintained. Approximately 7 000 bottles per cultivar are annually produced and surplus grapes are sold to other cellars. 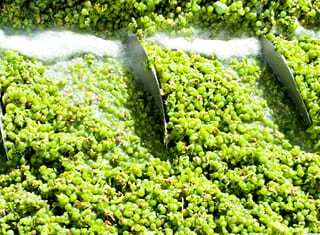 The winemaking focus is to produce wines with maturation potential instead of young floral characteristics. The wines are sold in two different brands, namely the premium, matured PaardenKloof and the easy drinkable Ecology range, which are wines of the same quality, but representing the younger vintages. Ecology is a smallholding which was bought in 2015 and due to its location next to the R43 between Bot River and Hermanus, makes the PaardenKloof products more readily available to travellers. An interesting restaurant at Ecology, where meals are prepared from the farm’s meat, complement the wines. All wines are certified as 100% single vineyard cultivar wines. 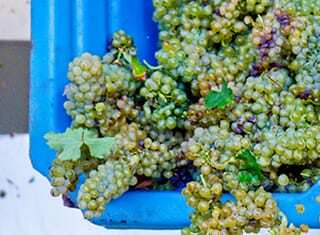 The Sauvignon blanc is bottled without any wood maturation in the year of production and then bottle matured. After one year and two to three years bottle maturation, it is sold as Ecology or PaardenKloof Sauvignon Blanc respectively. 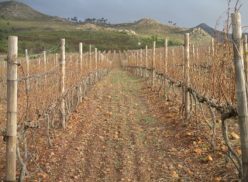 In the case of the red wines, the wines are sold after two and six years maturation as Ecology or PaardenKloof red cultivar wines respectively. This maturation includes 14 months wood maturation. 2012 PaardenKloof Sauvignon Blanc: Passion fruit, guava and kiwifruit flavours. 2013 PaardenKloof Sauvignon Blanc: Fresh lime, grapefruit and fynbos flavours. 2015 Ecology Sauvignon Blanc: Fresh passion fruit and pineapple flavours. 2009 PaardenKloof Shiraz: Ripe plum, fynbos, spicy, dark chocolate and white pepper flavours. 2014 Ecology Shiraz: Easy drinkable with berry, caramel and toffee flavours. 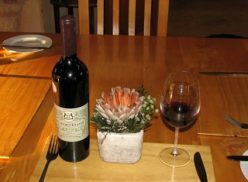 2009 PaardenKloof Cabernet Sauvignon: Dark plum, berry, exotic dry flower flavours. 2014 Ecology Cabernet Sauvignon: Ruby red with leather and tobacco flavours. The Pinot noir range will be launched later this year. Most of the wines are sold to PaardenKloof club members or at Ecology and seeing that minimal marketing or distribution costs are applicable the well matured wines are sold at reasonable prices. PHOTO 2. Pinot noir vineyard on PaardenKloof. PHOTO 3. 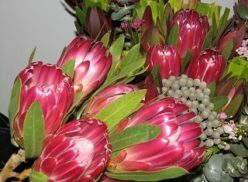 Fresh indigenous PaardenKloof proteas and fynbos. PHOTO 4. Protea longifolia, one of the vulnerable species on PaardenKloof. PHOTO 5. PaardenKloof Cabernet Sauvignon in a fynbos blend.